Mom's New Favorite Brie and Berry Bake! Using a spoon, scoop out the flesh of the watermelon into a blender. Reserve rinds. Blend until smooth. In a medium saucepan, heat the pureed watermelon and lemon zest to a simmer over medium heat. Add the strawberry and orange gelatin, stir until dissolved. Remove from heat. Stir in the sparkling water. 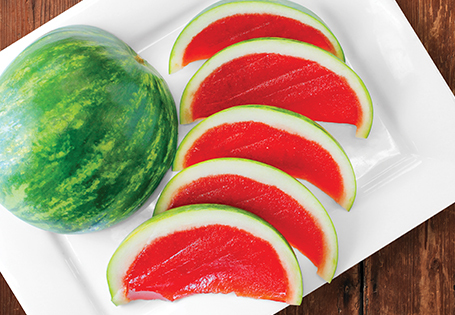 Place the watermelon rinds into two bowls large enough to keep the opening level. Pour the gelatin into the rind and refrigerate for 2 hours or until set. Slice and serve.